Spicebush swallowtail butterflies like this female lay their eggs on spicebush so their caterpillars can feed on its leaves when they hatch. 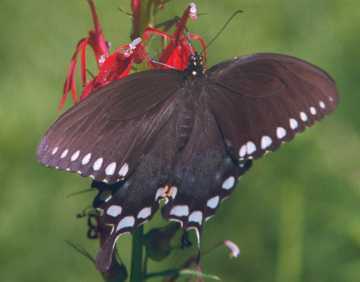 Look for these butterflies in May and July-August when they seek nectar at wildflowers such as cardinal flower, which blooms in the summer. While the branches are still bare in mid- to late April, our swamps and wooded wetlands are adorned with the small yellow blossoms of common spicebush, a native shrub with good things for people, butterflies, and birds. Common spicebush (Lindera benzoin) is sometimes called the "forsythia of the woods" because of the timing and color of its flowering. The flowers are small - much smaller than forsythia blossoms - but make a welcome sight at the edges of streams, vernal pools, and other wet areas. The blossoms come in male and female versions, on separate plants. A good place to find spicebush is along some of the trails in the town's Libbey property off Adams Street, which is also accessible from the trails through Wile Forest, off Carroll Drive. At this time of year it's wise to wear boots or other footwear that will keep you dry. Check for spicebush near the vernal pools in the Bowman Street Conservation Area and the Headwaters Conservation Area, and elsewhere. If you notice an area where skunk cabbage is coming up, or know of an area that's lush with ferns in the summer, look along the edges of that wet area for spicebush. 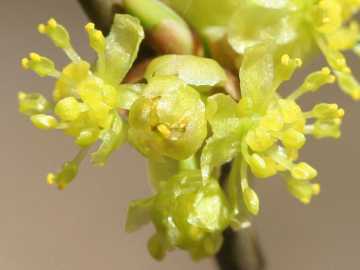 In mid-April the bare branches of common spicebush are studded with small yellow blossoms about the size of an eraser on a pencil. Shown here are pollen-producing male flowers, greatly enlarged. The name spicebush is a clue to the ways that people have found to put this shrub to use. Its bark, twigs, leaves, and red berries give off a mild spicy aroma when crushed. The best way to get a whiff is to break a small twig and sniff it. In Revolutionary War times, colonists used spicebush berries as substitute for allspice. They dried the berries and made them into powder. Not surprisingly, another name for this shrub was wild allspice. Colonists, and Native Americans before them, made a fragrant tea from the leaves and twigs. Spicebush tea also had medicinal uses in treating colds, fevers, gas, and worms. Oil from the berries was rubbed on bruises and sore muscles and joints. The leaves can be used as an insect repellent, as many veteran hikers know. Common spicebush is important in the life of a large blue-black butterfly, named, quite appropriately, the spicebush swallowtail. This butterfly lays its eggs on spicebush, as well as on sassafras, another aromatic native plant. When they hatch, the caterpillars of the spicebush swallowtail feed on the leaves. Late June can be a good time to look for the caterpillars on the new leaves. In their early stages, the caterpillars look like bird droppings on the leaves - an effective camouflage. In their final stage, before transforming into butterflies, the inch-and-a-half long caterpillars have a different disguise. They are green with large eyespots that make them look like a snake - which scares off predators such as birds. At this stage each caterpillar stays inside a leaf that it folds around itself during the daytime. Look for spicebush swallowtail butterflies in the woods and fields in May and then again in July and August. Common spicebush also feeds the birds when its berries ripen in the first half of September. The glossy red, egg-shaped berries are nutritious due to the fat that they contain in the form of oil. They promptly disappear, eaten by birds fueling up for their migration. Robins, Northern bobwhites, gray catbirds, Eastern kingbirds, great crested flycatchers, and Northern mockingbirds all like spicebush berries. For people interested in gardening or landscaping, the New England Wild Flower Society recommends common spicebush as an alternative to garden shrubs that have proven to be invasive. Such non-native invasives include barberry, winged euonymus (burning bush), buckthorn, Russian olive, shrubby honeysuckle, and privet. Common spicebush rewards the eye with its yellow blossoms in early spring, red berries in late summer, and yellow foliage in autumn. It is disease-resistant and somewhat salt-tolerant. It grows in shade and partial shade, as well as wet areas. To get berries, gardeners need to plant both male and female plants.